Character vector inputs have been removed. Instead, use syms to declare variables and replace inputs such as solve('2*x == 1','x') with solve(2*x == 1,x). S = solve(eqn,var) solves the equation eqn for the variable var. If you do not specify var, the symvar function determines the variable to solve for. For example, solve(x + 1 == 2, x) solves the equation x + 1 = 2 for x. S = solve(eqn,var,Name,Value) uses additional options specified by one or more Name,Value pair arguments. Y = solve(eqns,vars) solves the system of equations eqns for the variables vars and returns a structure that contains the solutions. If you do not specify vars, solve uses symvar to find the variables to solve for. In this case, the number of variables that symvar finds is equal to the number of equations eqns. Y = solve(eqns,vars,Name,Value) uses additional options specified by one or more Name,Value pair arguments. [y1,...,yN] = solve(eqns,vars) solves the system of equations eqns for the variables vars. The solutions are assigned to the variables y1,...,yN. If you do not specify the variables, solve uses symvar to find the variables to solve for. In this case, the number of variables that symvar finds is equal to the number of output arguments N.
[y1,...,yN] = solve(eqns,vars,Name,Value) uses additional options specified by one or more Name,Value pair arguments. [y1,...,yN,parameters,conditions] = solve(eqns,vars,'ReturnConditions',true) returns the additional arguments parameters and conditions that specify the parameters in the solution and the conditions on the solution. Use the == operator to specify the equation sin(x) == 1 and solve it. Find the complete solution of the same equation by specifying the ReturnConditions option as true. Specify output variables for the solution, the parameters in the solution, and the conditions on the solution. The solution pi/2 + 2*pi*k contains the parameter k which is valid under the condition in(k, 'integer'). This condition means the parameter k must be an integer. If solve returns an empty object, then no solutions exist. If solve returns an empty object with a warning, solutions might exist but solve did not find any solutions. Return the complete solution of an equation with parameters and conditions of the solution by specifying ReturnConditions as true. Solve the equation sin(x) = 0. Provide two additional output variables for output arguments parameters and conditions. The solution pi*k contains the parameter k and is valid under the condition in(k,'integer'). This condition means the parameter k must be an integer. k does not exist in the MATLAB® workspace and must be accessed using param. Find a valid value of k for 0 < x < 2*pi by assuming the condition, cond, and using solve to solve these conditions for k. Substitute the value of k found into the solution for x. A valid value of k for 0 < x < 2*pi is 1. This produces the value x = pi. Alternatively, find a solution for x by choosing a value of k. Check if the value chosen satisfies the condition on k using isAlways. Check if k = 4 satisfies the condition on k.
isAlways returns logical 1 (true), meaning 4 is a valid value for k. Substitute k with 4 to obtain a solution for x. Use vpa to obtain a numeric approximation. Avoid ambiguities when solving equations with symbolic parameters by specifying the variable for which you want to solve an equation. If you do not specify the variable, solve chooses a variable using symvar. First, solve the quadratic equation without specifying a variable. solve chooses x to return the familiar solution. Then solve the quadratic equation for a to return the solution for a. When solving for more than one variable, the order in which you specify the variables defines the order in which the solver returns the solutions. Solve this system of equations and assign the solutions to variables solv and solu by specifying the variables explicitly. The solver returns an array of solutions for each variable. Entries with the same index form the solutions of a system. A solution of the system is v = - (2^(1/2)*1i)/3 - 2/3, and u = 1/3 - (2^(1/2)*1i)/3. When solving for multiple variables, it can be more convenient to store the outputs in a structure array than in separate variables. The solve function returns a structure when you specify a single output argument and multiple outputs exist. Solve a system of equations to return the solutions in a structure array. Access the solutions by addressing the elements of the structure. Using a structure array allows you to conveniently substitute solutions into expressions. The subs function substitutes the correct values irrespective of which variables you substitute. Substitute solutions into expressions using the structure S.
Return the complete solution of a system of equations with parameters and conditions of the solution by specifying ReturnConditions as true. A solution is formed by the elements of the same index in S.x, S.y, and S.conditions. Any element of S.parameters can appear in any solution. For example, a solution is x = pi*k - asin(3^(1/2)/3), and y = 2*pi*k - 2*asin(3^(1/2)/3), with the parameter k under the condition in(k, 'integer'). This condition means k must be an integer for the solution to be valid. k does not exist in the MATLAB workspace and must be accessed with S.parameters. For the first solution, find a valid value of k for 0 < x < pi by assuming the condition S.conditions(1) and using solve to solve these conditions for k. Substitute the value of k found into the solution for x. A valid value of k for 0 < x < pi is 1. This produces the value x = pi - asin(3^(1/2)/3). isAlways returns logical 1 (true) meaning 4 is a valid value for k. Substitute k with 4 to obtain a solution for x. Use vpa to obtain a numeric approximation. When solve cannot symbolically solve an equation, it tries to find a numeric solution using vpasolve. The vpasolve function returns the first solution found. Try solving the following equation. solve returns a numeric solution because it cannot find a symbolic solution. Warning: Unable to solve symbolically. Returning a numeric solution using vpasolve. Plot the left and the right sides of the equation. Observe that the equation also has a positive solution. Find this solution by directly calling the numeric solver vpasolve and specifying the interval. solve can solve inequalities to find a solution that satisfies the inequalities. Solve the following inequalities. Set ReturnConditions to true to return any parameters in the solution and conditions on the solution. The parameters u and v do not exist in the MATLAB workspace and must be accessed using sol.parameters. Check if the values u = 7/2 and v = 1/2 satisfy the condition using subs and isAlways. isAlways returns logical 1 (true) indicating that these values satisfy the condition. Substitute these parameter values into sol.x and sol.y to find a solution for x and y. Convert the solution into numeric form by using vpa. Solve this equation. It has five solutions. Return only real solutions by setting argument Real to true. The only real solution of this equation is 5. Solve this equation. Instead of returning an infinite set of periodic solutions, the solver picks these three solutions that it considers to be most practical. Pick only one solution using PrincipalValue. Try to solve this equation. By default, solve does not apply simplifications that are not always mathematically correct. As a result, solve cannot solve this equation symbolically. Set IgnoreAnalyticConstraints to true to apply simplifications that might allow solve to find a result. For details, see Algorithms. solve applies simplifications that allow it to find a solution. The simplifications applied do not always hold. Thus, the solutions in this mode might not be correct or complete, and need verification. The sym and syms functions let you set assumptions for symbolic variables. Assume that the variable x can have only positive values. When you solve an equation or a system of equations for a variable under assumptions, the solver only returns solutions consistent with the assumptions. Solve this equation for x. Allow solutions that do not satisfy the assumptions by setting IgnoreProperties to true. For further computations, clear the assumption that you set on the variable x by recreating it using syms. When solving polynomials, solve might return solutions containing root. To numerically approximate these solutions, use vpa. Consider the following equation and solution. Because there are no parameters in this solution, use vpa to approximate it numerically. When you solve a higher order polynomial equation, the solver might use root to return the results. Solve an equation of order 3. Try to get an explicit solution for such equations by calling the solver with MaxDegree. The option specifies the maximum degree of polynomials for which the solver tries to return explicit solutions. The default value is 2. Increasing this value, you can get explicit solutions for higher order polynomials. Solve the same equations for explicit solutions by increasing the value of MaxDegree to 3. Equation to solve, specified as a symbolic expression or symbolic equation. The relation operator == defines symbolic equations. If eqn is a symbolic expression (without the right side), the solver assumes that the right side is 0, and solves the equation eqn == 0. Variable for which you solve an equation, specified as a symbolic variable. By default, solve uses the variable determined by symvar. System of equations, specified as symbolic expressions or symbolic equations. If any elements of eqns are symbolic expressions (without the right side), solve equates the element to 0. Variables for which you solve an equation or system of equations, specified as symbolic variables. By default, solve uses the variables determined by symvar. The order in which you specify these variables defines the order in which the solver returns the solutions. Example: 'Real',true specifies that the solver returns real solutions. Flag for returning parameters in solution and conditions under which the solution is true, specified as the comma-separated pair consisting of 'ReturnConditions' and one of these values. false Do not return parameterized solutions. Do not return the conditions under which the solution holds. The solve function replaces parameters with appropriate values. true Return the parameters in the solution and the conditions under which the solution holds. For a call with a single output variable, solve returns a structure with the fields parameters and conditions. For multiple output variables, solve assigns the parameters and conditions to the last two output variables. This behavior means that the number of output variables must be equal to the number of variables to solve for plus two. Example: [v1, v2, params, conditions] = solve(sin(x) +y == 0,y^2 == 3,'ReturnConditions',true) returns the parameters in params and conditions in conditions. Simplification rules applied to expressions and equations, specified as the comma-separated pair consisting of 'IgnoreAnalyticConstraints' and one of these values. false Use strict simplification rules. true Apply purely algebraic simplifications to expressions and equations. Setting IgnoreAnalyticConstraints to true can give you simple solutions for the equations for which the direct use of the solver returns complicated results. In some cases, it also enables solve to solve equations and systems that cannot be solved otherwise. Setting IgnoreAnalyticConstraints to true can lead to wrong or incomplete results. Flag for returning solutions inconsistent with the properties of variables, specified as the comma-separated pair consisting of 'IgnoreProperties' and one of these values. false Do not exclude solutions inconsistent with the properties of variables. true Exclude solutions inconsistent with the properties of variables. Maximum degree of polynomial equations for which solver uses explicit formulas, specified as a positive integer smaller than 5. The solver does not use explicit formulas that involve radicals when solving polynomial equations of a degree larger than the specified value. Flag for returning one solution, specified as the comma-separated pair consisting of 'PrincipalValue' and one of these values. true Return only one solution. If an equation or a system of equations does not have a solution, the solver returns an empty symbolic object. Flag for returning only real solutions, specified as the comma-separated pair consisting of 'Real' and one of these values. true Return only those solutions for which every subexpression of the original equation represents a real number. Also, assume that all symbolic parameters of an equation represent real numbers. Solutions of an equation, returned as a symbolic array. The size of a symbolic array corresponds to the number of the solutions. Solutions of a system of equations, returned as a structure. The number of fields in the structure correspond to the number of independent variables in a system. If ReturnConditions is set to true, the solve function returns two additional fields that contain the parameters in the solution, and the conditions under which the solution is true. Solutions of a system of equations, returned as symbolic variables. The number of output variables or symbolic arrays must be equal to the number of independent variables in a system. If you explicitly specify independent variables vars, then the solver uses the same order to return the solutions. If you do not specify vars, the toolbox sorts independent variables alphabetically, and then assigns the solutions for these variables to the output variables. Parameters in a solution, returned as a vector of generated parameters. This output argument is only returned if ReturnConditions is true. If a single output argument is provided, parameters is returned as a field of a structure. If multiple output arguments are provided, parameters is returned as the second-to-last output argument. The generated parameters do not appear in the MATLAB workspace. They must be accessed using parameters. Example: [solx, params, conditions] = solve(sin(x) == 0, 'ReturnConditions', true) returns the parameter k in the argument params. Conditions under which solutions are valid, returned as a vector of symbolic expressions. This output argument is only returned if ReturnConditions is true. If a single output argument is provided, conditions is returned as a field of a structure. If multiple output arguments are provided, conditions is returned as the last output argument. Example: [solx, params, conditions] = solve(sin(x) == 0, 'ReturnConditions', true) returns the condition in(k, 'integer') in conditions. The solution in solx is valid only under this condition. If solve cannot find a solution and ReturnConditions is false, the solve function internally calls the numeric solver vpasolve that tries to find a numeric solution. If solve cannot find a solution and ReturnConditions is true, solve returns an empty solution with a warning. If no solutions exist, solve returns an empty solution without a warning. For polynomial equations and systems without symbolic parameters, the numeric solver returns all solutions. For nonpolynomial equations and systems without symbolic parameters, the numeric solver returns only one solution (if a solution exists). If the solution contains parameters and ReturnConditions is true, solve returns the parameters in the solution and the conditions under which the solutions are true. If ReturnConditions is false, the solve function either chooses values of the parameters and returns the corresponding results, or returns parameterized solutions without choosing particular values. In the latter case, solve also issues a warning indicating the values of parameters in the returned solutions. If a parameter does not appear in any condition, it means the parameter can take any complex value. The output of solve can contain parameters from the input equations in addition to parameters introduced by solve. 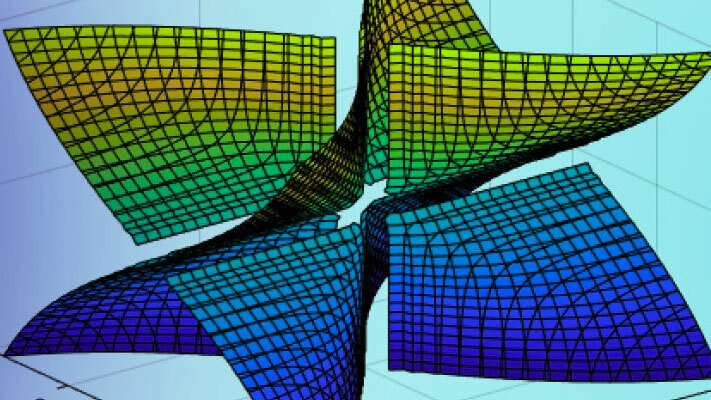 Parameters introduced by solve do not appear in the MATLAB workspace. They must be accessed using the output argument that contains them. Alternatively, to use the parameters in the MATLAB workspace use syms to initialize the parameter. For example, if the parameter is k, use syms k.
The variable names parameters and conditions are not allowed as inputs to solve. The syntax S = solve(eqn,var,'ReturnConditions',true) returns S as a structure instead of a symbolic array. To solve differential equations, use the dsolve function. When solving a system of equations, always assign the result to output arguments. Output arguments let you access the values of the solutions of a system. MaxDegree only accepts positive integers smaller than 5 because, in general, there are no explicit expressions for the roots of polynomials of degrees higher than 4. The output variables y1,...,yN do not specify the variables for which solve solves equations or systems. If y1,...,yN are the variables that appear in eqns, then there is no guarantee that solve(eqns) will assign the solutions to y1,...,yN using the correct order. Thus, when you run [b,a] = solve(eqns), you might get the solutions for a assigned to b and vice versa. To ensure the order of the returned solutions, specify the variables vars. For example, the call [b,a] = solve(eqns,b,a) assigns the solutions for a to a and the solutions for b to b. When you use IgnoreAnalyticConstraints, the solver applies these rules to the expressions on both sides of an equation. The solver can multiply both sides of an equation by any expression except 0. The solutions of polynomial equations must be complete.